When I’ve done reading challenges before, they’ve been numbers based, along the lines of “I promise to read 100 books this year.” The numbers game hasn’t led to much reflection for me. Mostly, it’s led to anxiety about keeping up. 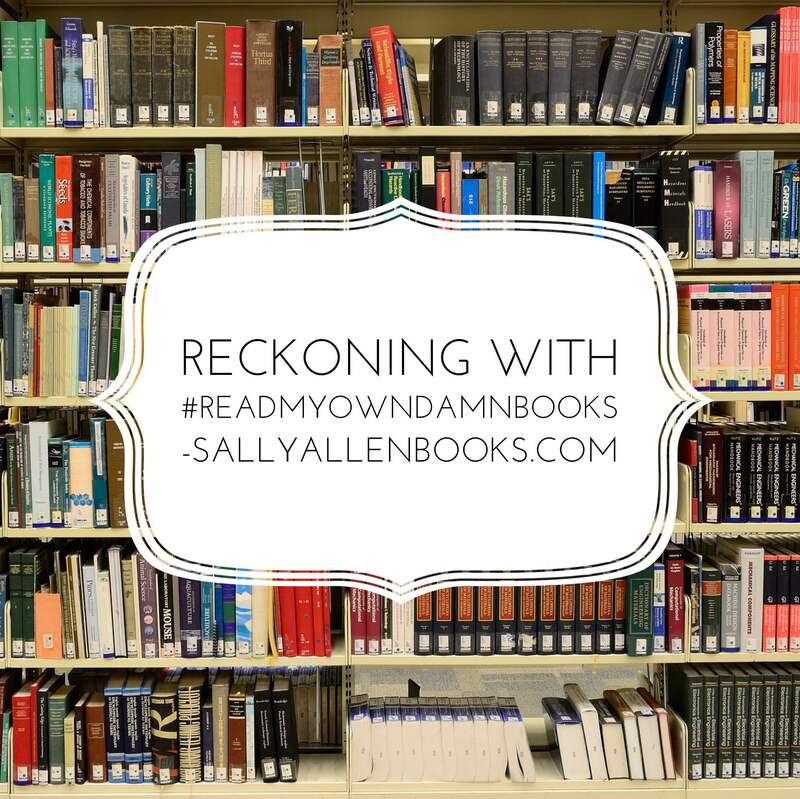 #ReadMyOwnDamnBooks is the first yearlong challenge that has pushed me to think about my reading habits and patterns as well as what I want for myself as a reader and what is realistic for me as a person. I’ve reflected on these before, of course, but not in the context of an explicit challenge. In the process, I’ve learned quite a few lessons about reading, and myself. 1. My library was becoming a distraction in itself. I’ve accumulated so many books that I was in a perpetual state of overwhelm. This translates beyond books as well. Too much stuff has a way of dominating one’s time. I don’t want my life to be about dusting, organizing, and otherwise managing all the stuff, including books, I’ve accumulated. I want to read books and have adventures. This isn’t exactly news to me, but it helps to keep reminding myself of it. 2. Having to continue returning to my library instead of checking out appealing new books has made me realize … I am always going to want new books. I will always find new books that interest me. New stories represent new adventures, new possibilities. I love both. Right at this moment, I want books that haven’t come out yet – Liane Moriarty’s Truly Madly Guilty , J. K. Rowling’s Harry Potter and the Cursed Child , Maryrose Wood’s next Incorrigible Children book, Rick Riordan’s next The Trials of Apollo book. 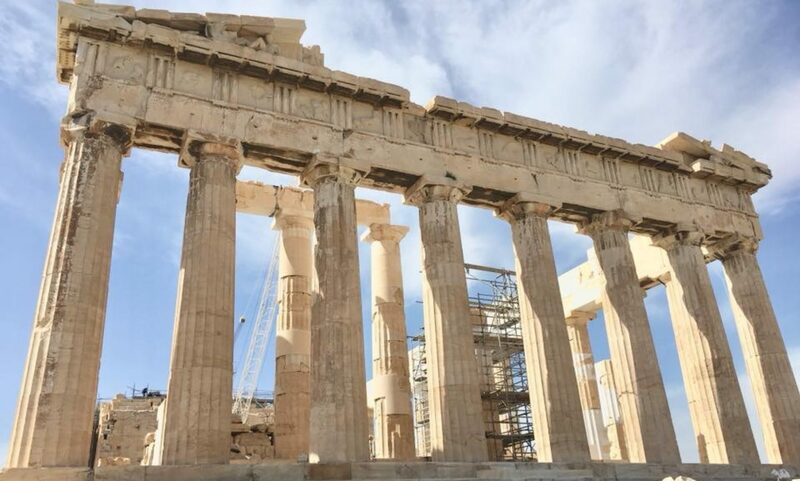 I want books that have already been published – Harry Mount’s Odyssey: Ancient Greece in the Footsteps of Odysseus by Harry Mount, a few of M. C. Beaton’s Hamish Macbeth mysteries, The Republic of Imagination: A Life in Books by Azar Nafisi. So many books. I. Want. Them. All. 3. Ah yes: I do not need to stockpile books. I will say that one again: I do not need to stockpile books. Especially when I’m acquiring them on the cheap, on a whim. When that whim fades, probably never to be rekindled, I’m … let us say (for the sake of example) $18 poorer. Instead of buying seven e-books I’ll probably never read, I could have purchased one book that I will cherish and want to reread. For example, this year, I borrowed Station Eleven by Emily St. John Mandel from the library. I wish I had the hardcover edition for rereading instead of the hundreds of e-books I’m only marginally interested in reading for the first time. Which leads to another point: I need to save some of my budget for those times I want to read the “it” book everyone is talking about. That’s part of the fun of being bookish in the 21st century! 4. Unfortunately, the flip side of this is I’ve also learned I will probably always stockpile books, at least a little. Physical books feel so comforting to have around me – voices across time and space reminding me of the beauty in this vast, unknowable world we inhabit and the people within it, reminding me that we’re all connected, sometimes even when we wish we weren’t. E-books let me bring the world with me wherever I go, and I like that feeling. My e-reader, my own little Tardis: It’s bigger on the inside, just as individual books are. So I expect I’ll carry on acquiring books, some of which I’ll probably never read. However, this doesn’t mean I can’t be a bit savvier about the kind of books I invest in, so I spent part of this week inventorying my e and paper libraries. The first thing I noticed: I don’t have as much of an overflow with paper books. My unread e-books probably outnumber my unread paper books by about a 4 to 1 ratio. One reason is e-book sales. The other is that e-books are not tangible, so I don’t have a physical sense of the enormous beast my e-library is becoming. 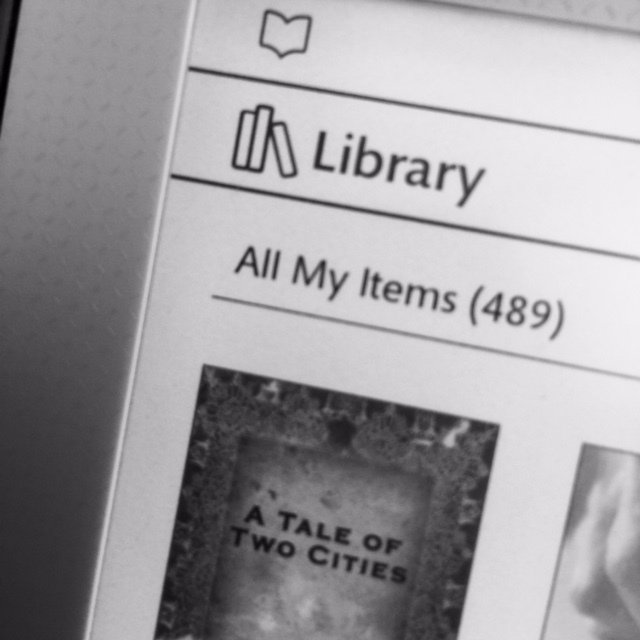 Upon being downloaded, my e-books are whisked into my bigger-on-the-inside e-reader, conveniently out of sight. I don’t have to make room for them or dust them. E-books are entirely too discrete. 5. Stop buying cheap e-books unless they’re books I already want to read. In other words: Quit the impulse buying. I’ve made progress on this in June: This month, I only bought e-books I’m planning to read immediately. One I have already read; another is a preorder and the third a collection of classics on my to-read list. The big progress for me this month: I have resisted every $2.99 and under deal sent to me and unsubscribed from several of the emails. While I plan to continue reading my own books right through December 31, I’ve also decided to accept that I may never read all the books I own. And that is okay. If I read 50 percent my own and 50 percent new from now until 2017, that is also okay. In this spirit, I’ve set another goal for this year: I’m going to pare down and reorganize my paper books and donate the ones I don’t plan to read or that I’ve read but don’t plan to reread. It’s long overdue! And I’m looking forward to what else I’ll learn over the next six months of 2016. Anyone else doing a reading challenge this month? How’s it going? This was so well-thought-out. And I like that while reading books you already own has brought its rewards, you also recognize that you like and want to have new books in your life, too. I love the idea of your continuing to focus on reading your own books, but combining that with new ones, too. And donating books you don’t want always gets a thumbs up from me . I hope you’ll write about organizing your paper books, what you find, what you donate, etc. Thank you so much, Alysa. I love that this challenge is giving me so much to think about and helping me better understand my bad habits (those impulse buys!) and how to get ahead of them, so to speak. You are exactly right! I’m still working on #ReadMyOwnDamnBooks challenge.